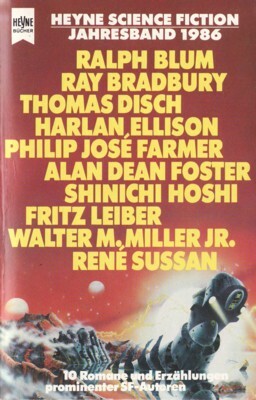 First edition (not stated), apparent first printing. The ISBN 3-453-31241-1 is stated on the back, but the ISBN 3-453-31241-4 is reported on the copyright page (p. 4). The copyright is assigned 1986 to the publisher. The translators are credited on the copyright page and at the end of each respective feature item (for translations see individual titles). Month of publication from 'Science Fiction Times, August 1985' (Heyne program preview).